Heather: Tell us more about Peter Caine. What drew you to this character? What challenges did you face writing about a not so nice main character? AF: I really enjoy writing flawed, anti-heroic characters. I feel in life and literature the focus often falls on the loveable ones, and I think it’s unfair. Not everyone is a stupendously likeable person, but everyone has a story. My stories are almost always based in redemption in some way. Seeking it, failing to find it, finding it, or continuing the search forever. Peter Caine is a mix of a number of people I’ve known in life, both personally and professionally. I have worked with a lot of true sociopaths, and I find them unbelievably fascinating. Perfection and adoration are a little slow for me, a little boring. I’d rather have dinner with a villain, just to see how he ticks. That was the idea behind Peter Caine. Who are you, and why are you like this? 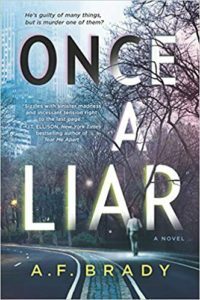 ONCE A LIAR also explores how people aren’t what they appear to be on the surface, whatever the surface may be. We should always look a little deeper to see the truth. We’re all M&Ms; whether you look at is as hard outside and soft inside, or shiny outside and dark underneath. Heather: Both ONCE A LIAR and your first novel THE BLIND take place in New York City. Why did you choose to set your stories in Manhattan? AF: I’m a New Yorker! Born and raised in this town, I love it, I know it inside and out, and I feel like it’s an excellent setting for stories because New York City has absolutely everything. You want grime and poverty and hopelessness? We’ve got it! You want glamour, glitz and riches? We’ve got it! NYC is brimming with everything the world has to offer, and everyone can find their place here if you just look hard enough. Heather: I’m always intrigued to learn about how other authors write. Please describe your writing space and your writing process? What works for you and what doesn’t? I usually map out characters and basic storylines before I get writing, but invariably my fingers take over and write things that I never thought were going to happen. I take a ton of notes all over the place; cocktail napkins, junk mail envelopes and catalogs, beautiful notebooks and on my phone. What doesn’t work for me is a great deal of forced structure. Sometimes I write for 12 straight hours and knock out 15k words in a day, sometimes I can’t think of what “unless” means. If I forced myself to follow a daily writing goal, as opposed to a weekly average, I would be crying all the time. Heather: We met about a year ago in Toronto at Bouchercon, an international mystery convention, and I knew right away that you were a lot of fun! (See picture to the right) It was so great to connect with you. Besides writing what do for a good time? 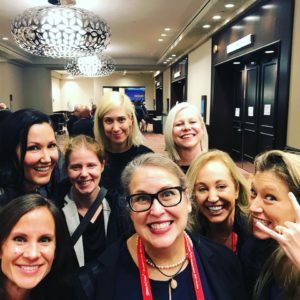 AF: Bouchercon was great! It was a pleasure spending time with you. I love fun. Fun is my favorite, and I try to make everything fun. Life is short, enjoy the grocery store. Life is short, blow up the rubber gloves in the doctor’s offices and draw chicken faces on them. My favorite thing these days is spending time with my kids, but otherwise, I love baseball, I’m a huge, unapologetic Yankee fan. I love food! Cooking, going out to eat, everything. I like board games, reading by the fire, swimming in any body of water I can find, traveling, etc. Heather: Where can readers connect with you? AF: AFBrady.com has all the ways to get in touch with me, I love connecting with readers. And on Facebook at AFBrady-Author, Twitter – https://twitter.com/AFBradyNYC and Instagram – AFBradyNYC. Let’s learn a little bit more about A.F with these fifteen rapid-fire questions and responses. Who is your writing heroine/hero? Everyone who tried to write when they thought they couldn’t. What’s your favorite genre to read in your free time? I try to read a diverse pile of books every year, but I always go back to fiction. Not necessarily suspense or thriller, more emotional, voice-driven stories. How do you organize your home library? I have a lot of bookcases, so they’re all sort of different. I have one that’s rainbow, a little one that’s all the different languages and editions of my books, one that’s all psychology books (I’m a psychotherapist) and the big one is organized by color family, but not rainbow. Name a book you can’t get out of your head? The Plague, Albert Camus. I reread it almost every year because everything about it is so accurate no matter what the context. Always follow the rats. Where is your favorite place to read? In the sun, near some body of water. Where do you do your writing? Everywhere my kids aren’t. When it comes to movies ~ Thrillers, RomComs, Drama, Horror, Comedy, Other? All of the above. Major League, Goodfellas, Pulp Fiction, When Harry Met Sally, Dumb and Dumber, A League of Their Own, I could watch all of these every day forever. What book is on your bedside table right now? If I’m honest, I’ve got several: The DSM-V desk reference, Syd Field’s Screenplay: The Foundations of Screenwriting, and Michelle Obama’s Becoming. I lead a weird and complicated life. What do you have coming next for readers? Just finished book three, working on book four. More psychological suspense, more unexpected characters, and more zinger endings!